True 1x magnification red dots are some of the most popular optics on the market. And this is for good reason, too. Low- or no-magnification red dots provide a rapid, no-hassle sighting system that shooters can rely on when lives are at stake, or when plinking at the range. The new Romeo4 red dot optic from SIG's Electro-Optics line is a perfect example of a rugged, simple-to-use, non-magnified red dot. Available in four different models, the Romeo4 offers a parallax-free, 1x red dot optic with unlimited eye relief and a 20mm objective clear aperture. Across all models, the optic features a 2 MOA red dot, with the ability to toggle to a 65 MOA circle dot with a 2 MOA red dot in the center on some models. Adjustments on the Romeo4 are in .5-MOA increments. The red dot has 10 daytime and two nighttime illumination settings and has an impressive runtime of 50,000 hours from one common CR2032 battery. The optic incorporates SIG's MOTAC (Motion Activated Illumination System), which powers up when motion is sensed and powers down when it's not, preserving battery life while remaining ready for action. The Romeo4 has an IPX-7 waterproof rating and is fog proof. It weighs 3.2 or 3.4 ounces, depending on the model. It also comes with Pica tinny low mounts or 1.41-in. co-witness riser mounts (standard or QD) for use with iron sights. The riser mounts work perfectly with back-up irons, and the QD mount is a snap to attach or detach from the firearm. 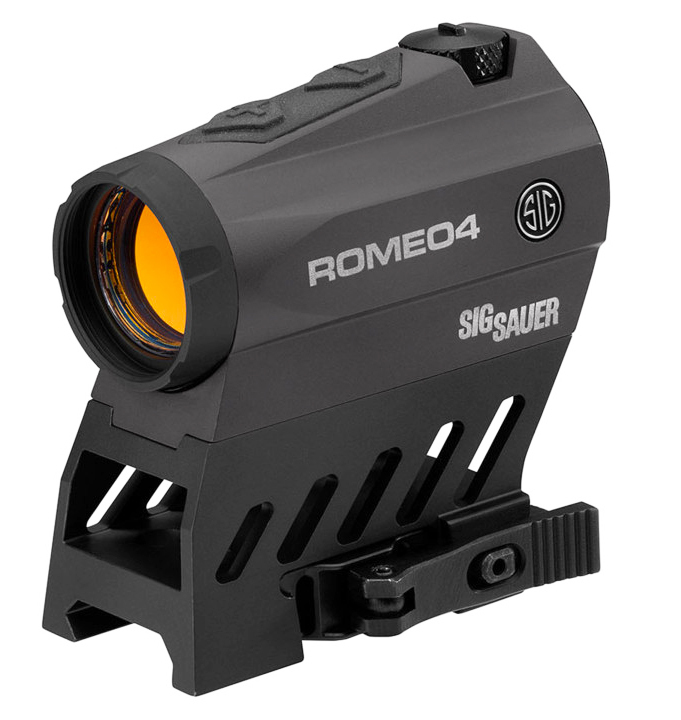 The Romeo4 red dot is available for $499 and comes with SIG's INFINITE Guarantee and Electronics Limited Warranty.